Me again. Is there more complete documentation than you have posted here? To try to get my RC working normally again, I tried turning IR Filter to On. This completely disabled my remote (including the power key) even after I turned off the unit. I now cannot start the TAP again without disabling my remote. It is a clever program, but I think it might be a bit too dangerous. Is there more complete documentation than you have posted here? To try to get my RC working normally again, I tried turning IR Filter to On. This completely disabled my remote (including the power key) even after I turned off the unit. I now cannot start the TAP again without disabling my remote. Have you read the chapter "Troubleshooting"? And have you read "Remote Control Interception" before using it? Your TF= and RC= settings should reflect the appropriate [M.*] mode. The first is, what your PVR is expecting (original RCU), the latter is your replacement RCU (or again your original RCU). Do you need the whole feature, actually? "IR Filter" must be turned ON only, if PVR and RCU are different, i.e.if you want to use a replacement RCU. Since my theory was that I had accidentally switched RCUs, it made sense to try turning on the filter. RCUs, but I was just trying to restore normal function. Actually, I don't think I've ever read an instruction manual before driving a car... but I did read this one. I appreciate your efforts in making this TAP available. I have stopped trying, at least for now. My RC is still behaving a bit strangely, but it is usable (as long as I don't start the TAP.) I don't think AcadeRC rewrites any firmware or anything, so the cause must be somewhere else. When I get a chance, I will check my Keytransform and TMSMacro files. After re-powering and w/o the TAP in Autostart, there are no remains left. The DATE function produces a soft clock that is reset on every boot, and the HWCLOCK function does not seem to be available. Maybe you can help with this. contains a link to TMSServer-patches.zip with an ntp program in it, written by myself. It gets the current time from the internet. * Full description of "Keycode Remapping"
DOWNLOAD by TapToDate (recommended) or by the built-in Update function in the TAP's menu (key sequence Sat - Menu). As announced above, the AcadeRC project is finished. Hello Australia! A happy new year to all Toppy lovers there! Display of .rec and media files' streams and codecs info. For .rec type files, you can determine e.g. the presence of 5.1 audio or the quality (bitrate) of recordings, even before an inspection on your PC. For media files, you may be able to find out, why a movie is not playable on your toppy (e.g. incompatible format or unsupported codec). DOWNLOAD: Initially, you can install AcadeRC via TapToDate (recommended), afterwards you have to call the built-in Update function in the TAP's menu (key sequence Sat + Menu or just the Menu key within the file browser). This is necessary anyway, to make sure all needed components and their last version are being present. TapToDate will be updated only for major releases of AcadeRC. This feature still shows the EPG infos of deleted .inf files that you have previously imported into their corresponding .rec files with rectool. .inf and .nav are not needed anymore, if you use AcadeRC and rectool. 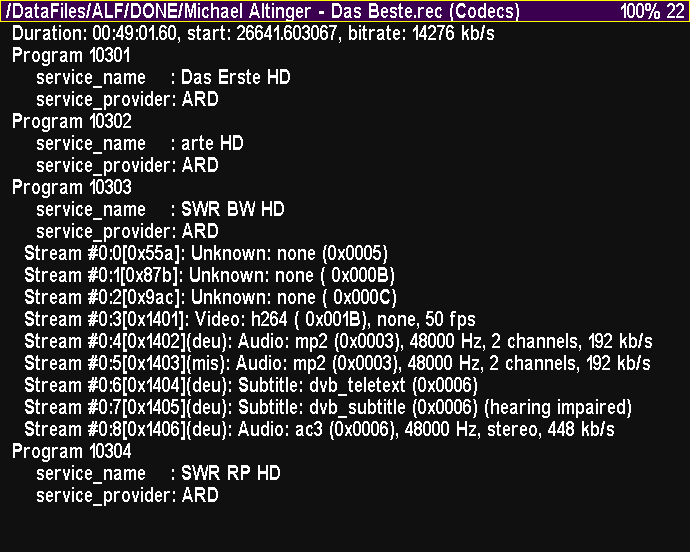 You can still replay, pause, skip by percent or by the yellow play bar, and display the EPG infos of these sole .rec files, even of old 5000 PVR recordings. See rectool's short description.